Rather than opting for a generic family drama, Leegrid Stevens levels up his story by layering in the world of 8-bit gaming in The Dudleys. A cathartic piece about the aftermath following the family patriarch's death, The Dudleys explores human emotion in a nostalgic digital world. 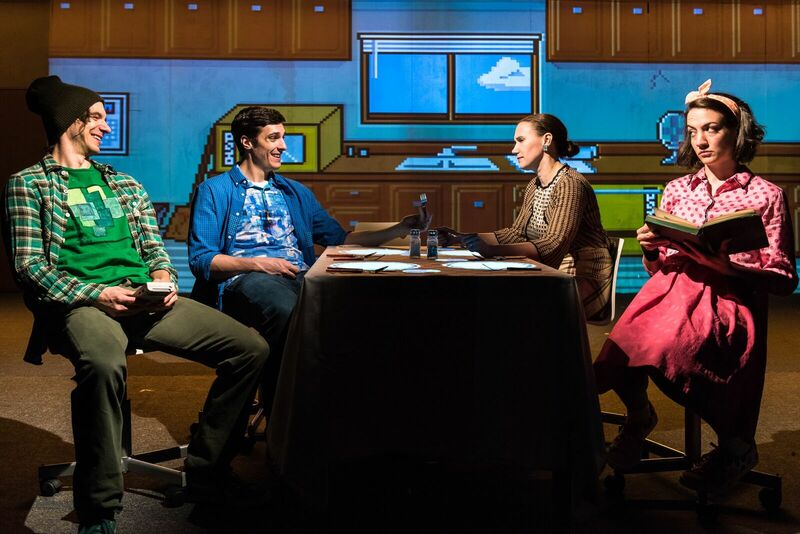 Produced by Loading Dock Theatre at HERE Arts Center, The Dudleys is unique in execution but lacks a strong, cohesive story to carry the audience on a two-hour journey. Told through the unique lens of an 8-bit video game of yore, The Dudleys is a play about loss and grief. A young man returns home to burry his father. He goes into his childhood bedroom and is engulfed by an old Nintendo game that has seemingly come to life. As the gamer plays, the Dudleys, the titular family from the game, engage in the aftermath of the recent tragedy, in classic game form. Between killing zombies to running from the cops, Leegrid Stevens offers a sentimental feel to the story. But there is no mystery or surprise to be had. The moment the gamer walks in and the game comes to life, the big twist becomes instantaneously predictable. While the story ultimately comes together, confusion sets in when the gamer presses start. The biggest roadblock for The Dudleys is the rules of the world. And the rules of this world are integral. Unfortunately, they don’t work. The story is essentially told out of order. The levels, or scenes, are not chronological. But in the world of video games, who is manipulating the level order and why is that allowed. Sure, from a theatrical standpoint, Stevens story order is interesting. But it doesn’t work with the concept he established. Stevens’ mission seemed to be infusing lighthearted humor into the weighty family drama. He found a way to bring that in through the gaming. His characters were defined but the dialogue was often bogged down by metaphor. For a play that relies on relationships, the familiar bond wasn’t as strong as it should have been. While each character had their personal woes and issues, they seemed to live in their own solitary world. The Dudleys is an ensemble effort yet it was all about the individuals. The standout of the bunch was Erik Kochenberger as Vic. Kochenberger has remarkable presence on stage. He has a command that is effortless, with an ease to crafting a relatable character. Kochenberger has a cinematic charm to his performance. Marlowe Holden had a complex character with Sylvia yet Holden had the sensibility to find the positivity through darkness of Sylvia’s situation. Amy Bizjak’s eccentric Meg was a brilliant antagonist despite the confusing arc her character experienced. Erin Treadway was able to find humor within the death-hungry widow Clara. Despite the outrageous world of the play, Treadway found reality in her character. The draw of this play is the unique visuals created by the skilled creative team. The set created by Jonathan Cottle was virtually just a canvas for video designer Reid Farrington. Farrington, along with animators David Bengali, David Mauro, Angela “Overkill” Hill, Roger Miller, Dan Monceaux, & Leegrid Stevens, captured the video game vibe effortlessly. It moved succinctly with the choreography from director Jacob Titus. The Dudleys was a tech heavy show. And it’s clear much time and thought went into the logistics. But Titus didn’t seem to handle the story as well as he did the production. Though the text was a giant factor. As much as you wanted to give sympathy to this family and the situation, there was little to give. When it came to costumes, Heather Carey found a color scheme for each individual that popped. Though the brown on Clara was a bit of a letdown in comparison to the vibrancy around her. Even if her character was depressed, a different color would have done the trick. Carey paid attention to fabrics and patterns to match the 8-bit world without becoming forced. The technical execution of Leegrid Stevens’ play was what The Dudleys will be remembered for. It was a daring production to say the least. Perhaps it was the lack of connection to the material that caused the audience to not get on board for the ride. When the audience is unsure of whether to clap or not at the intermission break, it’s a warning sign that something isn’t working.